← You can now buy an actual copy of my book made out of real dead trees!!! And I am now a professional paid author. Special thanks to my friend Bats at http://http://bats0711.wordpress.com/ She was the very first to buy my book in actual dead tree form. I have now promised to write a character based on her into the fifth part of the series, just as soon as I publish the other four which are already done. Thanks Bats. Don’t let me forget. But I have more exciting news. 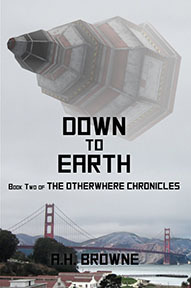 The first book is now available on Amazon.com in electronic form. I have no idea if this is an electronic form that will work with your electronic device or not. I am a computer moron, remember? But I have been assured by my technical whiz-kid daughter, who is also my publicist, that it will be available on most if not all types of reader/computer/smart phone/Ipad things sooner or later. The good news… for you… is that this version of the book is cheap. Really cheap. Much cheaper than it is on flat bits of dead tree. And I am starting it off at a special rate for all of you. Look at that. Its right on the top. I know it is too small to see, but trust me. 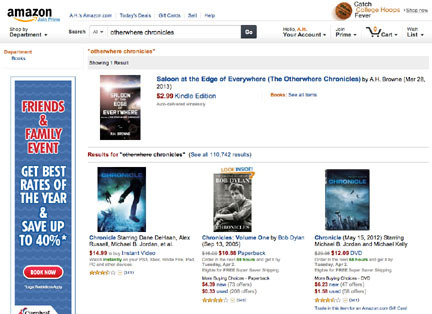 All you need to do is go to Amazon.com and do a search for ‘otherwhere chronicles’. In fact, if you could do that right now and let me know if it works, I would appreciate it. I will wait. If you are a big fan of dead trees… or electronics mystify and scare you like they do me… you can also go to thebookpatch.com and do a search for ‘otherwhere’ and order it in actual book form. Remember, unless you get a paper book made from trees that grew near a leaky nuclear power plant, these ‘paper’ books do not light up, so do not attempt top read them in the dark. Now here is the big favor I must ask. In order for me to become a really famous author… and have them make my books into a feature-length film with Brad Pitt playing me in the role as main character… I need some of you to actually buy the book. I know this is asking a lot, but I do need to pay the editor so I don’t actually lose money. What I need are reviews. If you think you remember enough of the story from when I was posting chapters here on the blog, or you just want to fake it and say nice things, maybe there is a way you can review it without having to buy one. I leave that up to your conscience. But it is all good. My dream has come true. I am a professional writer. In fact, since I have actually sold a few art projects, as soon as the band plays its first bar gig, I will be a professional artist,writer and musician, the trifecta, the trinity, the three-legged stool of all my dreams. This entry was posted in Stories of my life and tagged books, getting published, humor, literature, sci-fi, science fiction, writing. Bookmark the permalink. Hmmmmm…….Arthur Black…….Arthur Dent……..I am seeing a few other wildly similar comparisons to a little thing called “Hitchhikers guide to the galaxy”. One of my all time favorites. If this is even half as good it is a MUST read. I liked what I saw in the previews. I might have to add this to my paperback wish list. I wish you all the success in the otherwhere with this book. lol. 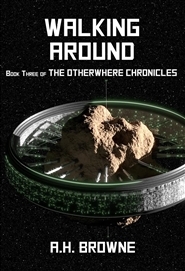 Thanks so much… the title is a nod to that awesome work of fiction… but my name is Arthur Browne… and the main character is me in another dimension… so it just worked out that way. Cool. Looking forward to finding time for it. Have you got Twitter, Art? Ya. Discover the usefulness of Twitter! People actually retweet you to their followers! It can go viral! And short and sweet and snappy. Eeekj Big thunder I am logging off! Never underestimate my stupidity!!! But seriously… thanks… I will check that out. (Cool about William Shatner by the way) Me not smart enough to go hunt down bigwigs.. I only got on Twitter to follow celebs and get them to answer me so my older daughter would go on facebook and admit that I am cool. That is so funny and cool! She did it too. Proudest moment of my life. Also, a big congratulations here. That is awesome, I will definitely have to look into it. I’ll see if I can get it on my dads Kindle. I let you know if that works haha. That would be really awesome. It is funny… and full of adventure. And the next three are already written. Congratulations! Thanks for stopping by my blog, Washington Freak Show and for the like. Wishing you continued success. Oh… gotcha. I might need to know a little more about you to do a character. And I make no promises about how it turns out… human… alien… good… bad… who knows. I can’t tell who you are because the profile thingy just says ‘somebody, with a generic little square. So you could be just about anybody already in the book for all I know. Congrats!!! I’m proud of you my blogging buddy! Just finished “Saloon”. I hope book one on the title page not of your warped sense of humor, but then again, without a warped sense of humor what’s the point. “so long and thanks for all the fish”. WOW. No indeed. There are three more finsihed books. I mean I have them written. I need to pay off my editor so we can start the final edits on the book two and then get it published. I hope it should be withing just a few months, but I don’t want to rush and have glitches? Did you have the glitches? And would you mind going to where yopu got it from a nd doing a review? I hate to ask. That’s so awesome, dude. Congratulations. You are now my hero. I think I might be my own hero now… is that wrong? I don’t think so. You gotta ride that high whenever it comes to you. At least there’s no lack of self-esteem, eh? I am a weird combination of pompous and shy. Woohoo from up here too! Congrats on publication – hope you sell a bundle. Many bundles! It will be hard to become rich and famous if I don’t. Thanks so much. Woohoo! Great news. I just tried buying a hard copy but the shipping was tons! I’ll have a plan, I will find out when my partner is next in America for work and will order to his company so he can pick it up from there. I didn’t even think about overseas shipping. I forgot I am an international sensation… Ha! Thanks buddy. The first part is only like 168 pages or something. It says on the description. I haven’t actually seen a copy yet. It is on the way. Only cost $3.00 for shipping. It said about $60 to UK, maybe I did something wrong, will try again. Unless they were including shipping to Mars. There should be multiple options. I had a list that went from three dollars to a lot more for priority first class. Did you try to have it shipped in a real space ship by actuall aliens? I may have done, who wants it delivered by Earth’s postal service, it’ll only get lost. It would be faster to send it by carrier pigion. I went to Amazon.com as you advised, but I could not find your book under Otherwise or Otherwise Chronicles – there was nothing even close to your book. I did, however, find it under Saloon at the Edge. Unfortunately, it’s only available in Kindle format & I have a Sony Reader, so until it’s available in other formats I will have to wait. Good luck & Happy Easter! Oh, oh some days I’m so dumb. Anyway I found it, just can’t get it. Is it a tecj issue? I know it works on Kindle. And I ordered an actual paper copy to make sure they are okay. I guess it will be available in the Apple store and on Ipads soon…Jess is working on it. Let me know what the problem is. So I can start figuring out what to tell people. It is a tech issue – my reader is a Sony Reader & it has different software than the Kindle. I had downloaded an app to convert it for my computer, but then I have to sit at my laptop to read a book & that’s so uncomfortable. I’ll have to check out if that works! I hope that there will be more forms available soon. I don’t know about Sony. Sory. Okay, you are the second person today to say that I upset your cat. Someone else woke their up from a nap laughing. Do I need to put up a legal disclaimer in my sidebar? No worries, since my favorite hobby is to combine reading and laughing, Sadi is used to it. Went to amazon to buy your book, kindle style. Haven’t read it yet but it just shouldn’t be that hard to buy the thing! Put a link on your page for goodness sake. Doesn’t that one in the sidebar work??? It does but it took me to the dead tree product and I was wanting the “save a tree” cyber product. 🙂 It got complicated even more since amazon.com kicked me back over the border to Canada… just cause I live here! If you figure it out by how much I get paid by the hour, it adds up to… not very much at all. Self publication is sort of easy to achieve… and I may end up bing played by Don Rickles… but thanks so much. I was going to wait for the electronic but somehow I felt the dead tree edition was more special. That tree died for a good cause. I was hoping you would play one of the aliens. Then you are my go to guy. I know it isn’t quite like the old days where you had to get rejection slips, but it is kind of exciting. Thanks so much. They are… now it is just a matter of scale… ha. I dream big, but reality has a way of scaling it down.